JNN 14 Dec 2014 Damascus : The Syria army on Wednesday continued tightening its grip on terrorists across the country through launching large-scale military operations in several provinces. Units of the army and the armed forces killed scores of terrorists and injured others and destroyed their equipment in Daraa al-Balad in the city of Daraa, southern Syria. Units of the army and the armed forces killed a number of terrorists and injured others in al-Sheikh Miskeen and Samlin in the countryside of the province. The terrorists’ equipment was destroyed. Units of the army and the armed forces destroyed dens and gatherings of terrorists, killing scores of them and injuring others in Naba al-Sakhr, Deir Maker and the surrounding of al-Ajraf area in the countryside of the southern province of Quneitra. Units of the army and the armed forces killed a number of terrorists and destroyed one of their vehicles, killing all terrorists onboard it, in the surrounding of Drousha farms in Damascus Countryside. 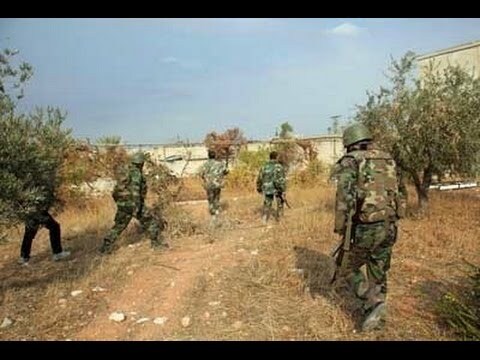 Units of the army and the armed forces killed scores of terrorists and destroyed their equipment in Beit al-Nabhan, Rajm al-Qseir, al-Msheirfeh al-Janoubiyeh and in the surrounding of Mount al-Shaer in the countryside of the central province of Homs. The army units also killed and injured a number of terrorists in al-Waer neighborhood in the city of Homs. Terrorists’ attempts to infiltrate towards Jisr al-Kharab in the countryside were also thwarted. This entry was posted in Middle East and tagged Attacks, damascus countryside, Syrian Army, Terrorists, the armed forces. Bookmark the permalink.